Burt's Bees Beeswax and Banana Hand Cream is a beautiful, rich and sweet sensation for the hands that is also 100% Natural. 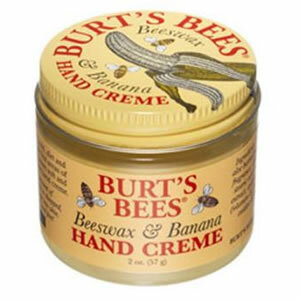 Burt's Bees Beeswax and Banana Hand Cream helps you to keep your hands soft and smooth with this super emollient banana hand cream; perfect if your dry hands are driving you bananas. Containing almond oil, aloe and vitamin E to moisturize and protect, this little magic jar can also help dry knees, elbows, ankles and feet.